Essential Oil Juniper Bioaroma was added to your shopping cart. Juniper natural essential oil suitable for footbath as relaxes tired feet, 100% pure. Essential oil Juniper Bioaroma is suitable for footbath as relaxes tired legs, 100% pure. • For swollen and tired legs from prolonged standing: Drip 15 drops of juniper essential oil and 15 drops of rosemary essential oil and leave feet to soak for 15-20 '. For pregnant women drip 15-20 drops of juniper essential oil and leave feet to soak for 15-20 '. Better to use in the afternoon since there is a possibility for frequent urination due to the elimination of unnecessary fluids from the body. Repeat this procedure 2-3 times a week. All products are made from 100% natural ingredients. BioΑroma has developed 100% natural herbal cosmetics based on research and archaeological finds that have been past down from generation to generation. The natural raw materials and an abundance of the organic treasures Crete’s earth produces include olive oil, beeswax, sage, dittany, labdanum gum…to name a few. These ingredients have inspired a range of Bioaroma products which offer a holistic approach to overall wellness. Our ingredients are utilized in a vertical integration of production, based on traditional methods combined with new technology-all this in order to maintain quality control and safety. No chemical preservatives, and so natural …that you can eat them. Crete has been recognized as a botanical paradise because of its optimal climatic conditions and the quality of the earth. This herbal abundance was discovered over 4.500 years ago by the ancient Minoan Civilization of Crete. Minoans were the first cosmetic producers to create herbal creams, ointments, oils and remedies that they would offer to royalty and export to neighboring lands. Bioaroma is an inspiration from the vast history and heritage that surrounds the land of Crete. 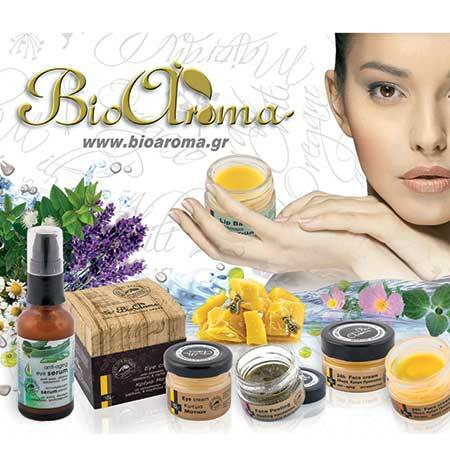 Herbal cosmetics derived from the Minoan palaces at the BioAroma laboratories.